An old ore wagon sits near the entrance of Sugarite Canyon State Park near Raton, New Mexico. Photo by Kathy Weiser-Alexander. Sugarite Canyon State Park is located on the Colorado–New Mexico state line six miles northeast of Raton, New Mexico. It is part of the Dry Cimarron Scenic Byway, which makes its way from Raton across Johnson Mesa to western Oklahoma. Sugarite Canyon (pronounced “shug-ur-eet”) sits in a sparsely-populated region consisting of a stream valley flanked by cliffs, mesas, cone-shaped volcanoes, and old lava flows. The 3,600-acre park is about four miles long and 1.5 miles wide and includes the ruins of the abandoned Sugurite coal mining camp, along with Lake Maloya and Lake Alice, both of which are stocked with rainbow and brown trout. Sugarite is believed to be the anglicized version of Chicorica, the original name of the canyon and adjacent mesa. Long before this beautiful canyon became a coal camp, it was called home to a number of Native American tribes, including the Comanche, Ute, and Apache who hunted here for centuries. The canyon was active with cattle ranches in the late 1800s. Later, Spanish explorers, mountain men, trappers, and traders traveled through the canyon as an alternative to Raton Pass. This area became part of the Maxwell Land Grant, that was originally awarded to Guadalupe Miranda and Charles Beaubien in 1841. Coal mining in the canyon began in 1894 and was first developed by the Chicorica Coal Company which opened the Hartsell and Meredith Mines. The Raton Fuel Company opened the Sugarite No. 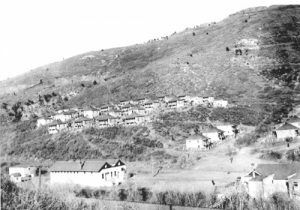 1 and 2 mines in 1901 and 1902. 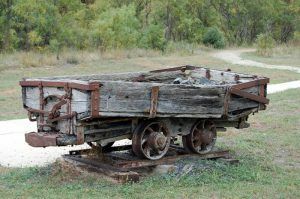 In the early days, miners relied on mules and burros to do the heavy work of pulling coal-filled carts from the underground mines to the surface. The coal was then hauled by wagon seven miles to Raton. A railroad line was initially constructed by the Santa Fe, Raton, and Eastern Railroad in 1905 to Lake Alice. However, it was cut back to the town of Sugarite in 1911. For decades, the railroad made runs from the Sugarite and Yankee mining camps to Raton, nearly every day. The coal mines were taken over by the St. Louis, Rocky Mountain, and Pacific Company in 1912, which quickly ramped up full-scale mining operations. The post office was established the same year and the “company town” of Sugarite was quickly developed. An orderly town of sturdy block houses perched upon canyon slopes. Sugarite, New Mexico during its busy coal mining days. The first school opened in a four-room house. Later a new two-room school was constructed containing a large auditorium upstairs which was used for dances, motion pictures, and other social events. The town also had a theater, the Blossburg Mercantile Company, the Bell Telephone Company, an opera house, a boarding house, a physician, a justice of the peace, and a music teacher. A clubhouse served as the center of activity during the cold winter months. Movies were shown there twice a week, cultural programs were sponsored by the Goldenrod Club, and the center had a soft drink bar and pool room. Church services were also held there. At one point it was said to have had a population of nearly 1,000 residents, many who hailed from Eastern Europe, Italy, Greece, Scotland, Wales, Ireland, Mexico, and even Japan. Sugarite’s population fluctuated for 100-200 residents from season to season and year to year and in 1915, reported about 500 people. After more than four decades of coal mining, which amounted to 562,497 tons, the mines began to shut down in 1941. At that time, there were 450 people living in the community. The railroad and the post office were closed in 1944. Afterward, many of the homes and buildings were moved to Raton and others were razed. 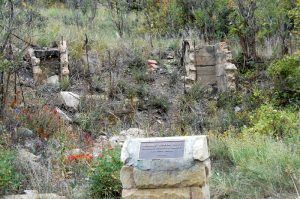 Ruins of the old Sugarite School House, by Kathy Weiser-Alexander. Sugarite Canyon State Park was established in 1985 and now receives about 125,000 visitors per year. At the park entrance are the remains of the Sugarite Coal Camp, including a couple of old buildings and numerous rock foundations. Amazingly, given its size, there is little left of the town of Sugarite other than low walls and foundations. 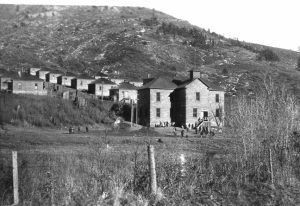 This was not uncommon at the time, as “company towns” were often moved — lock, stock and barrel to the “next” mining camp, or were sold off for salvage. However, a glimpse at the life of the miners can be seen if you take a scenic hike through the ruins, which includes numerous foundations along the interpretive trail. The visitor’s center is located in the old post office. A short distance north of the post office is a stone barn and a house, now utilized by the State Park and Recreation Division as a shop and warehouse and the park manager’s residence. The 40-stall barn once housed mules that were used in the coal mines. In addition to its history as a coal mining area, nature enthusiast will appreciate the abundance of wildlife, birds, butterflies, and wildflowers among the lakes, creeks, forests, and meadows. A number of outdoor recreation activities are possible including fishing, boating, hiking, horseback riding, hunting, and camping. 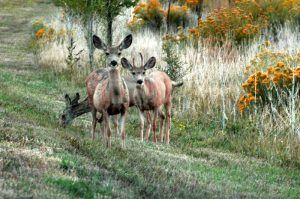 Deer in Sugarite Canyon, New Mexico.